As you may know, I’m a big fan of Lifehacker. I think their approach towards everything is brilliant and they’re often my go-to website if I’m not sure of anything technological (and often other stuff too). If you’re not keeping up to date with their posts, then you’re missing out and I heartily recommend you do something about it! The other day, Melanie Pincola wrote this article on the site, which outlines some really effective strategies based on burglary statistics. Here is a brief summary of the main points. Most Burglaries Occur Between 10:00 and 15:00. Whether this is true of the UK or not, it ultimately means very little. Beware the false sense of security that can arise from these kinds of statistics! While it is good to remember which peak times prevail in your local area for burglaries (get in touch with your local police force for information; they can steer you towards some up-to-date statistics), you should not feel that at other times there’s any cause for relaxation of your security measures! Thinking ‘Ahh, I’ll leave it – it’s after three…’ is not a good mindset! 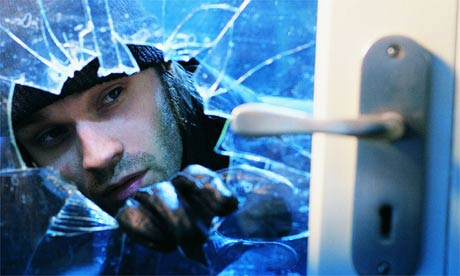 Just because most burglaries happen within certain times, it doesn’t mean the next one will! 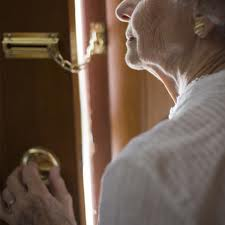 Burglars look for homes that appear unoccupied, and residential homes, as you know, tend to be empty during those hours because people are at work. If you’re out of the house during those hours and are concerned about burglaries in your neighborhood, consider setting a random timer to turn the TV or radio on during those hours. If you have a second car, keep it out in the driveway while you’re at work. Or, perhaps you can rent your driveway during the daytime (besides making your home less attractive to thieves, you can make a few extra bucks. Win! ); previously mentioned Park Circa is one place you can find people looking for a parking spot in your neighborhood. Do you use gardening services or other home maintenance services like window cleaning? Schedule those services (which don’t require you to be at home) during those prime theft hours. Good advice here, well worth following. Just make sure that you can trust whoever you’re sending around to your empty house to do work though! How do you know they’re not an opportunistic thief, or recently become laden with debt and are desperate to pay it off? That’s it – you don’t! "my scary dog can run faster than you" sign may be one of the most effective theft deterrents, other than—or in addition to—actually owning a scary dog. (Even a small dog prone to barking helps, though.) Regular "beware of dog" signs work too, especially if you add some additional supporting evidence of dog ownership, like leaving a dog bowl outside by your side door. The Washington Post suggests deadbolt locks, bars on windows, and pins in sash windows may be effective theft deterrents. It goes without saying to make sure all the entry points are locked (but, still, 6% of burglaries happen that way). Again, while this is excellent advice that we all should take into consideration, don’t think that older or younger, or female, local people can’t be burglars based on this! What we should take from this is that the more difficult we make our homes to break into, then the more warning we’ll get if someone’s breaking in, and the more time we’ll have for either the police to arrive after you call them or for you to escape, or whatever other plans you have in place. In order of percent of burglaries, thieves come in through: the front door, first-floor windows, and back door primarily, followed by the garage, unlocked entrances, and the basement. Look at reinforcing all of these entry points, of course, but if you want to know where the best places are to put your security cameras, the front and back door and first floor windows are your best bets. 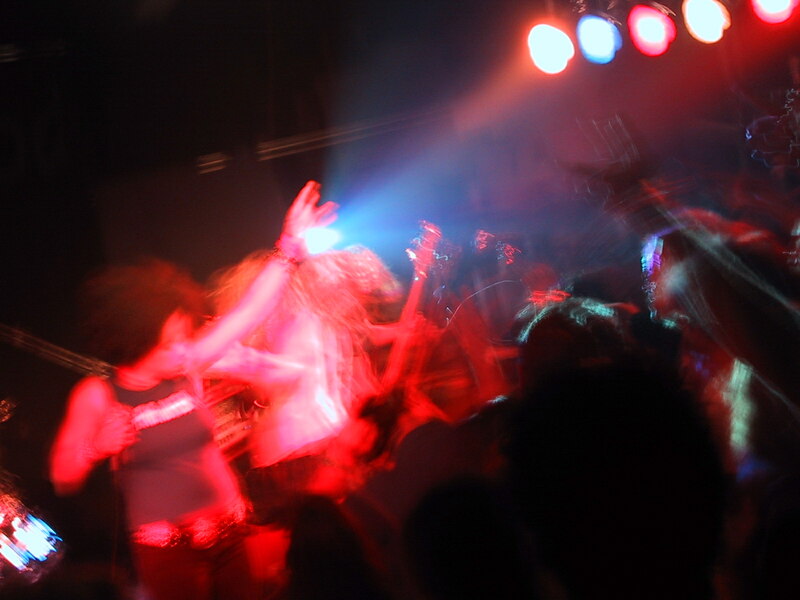 (We’ve featured quite a few DIY ones using old webcams or your PC.) Fake security cameras placed at those points might also be effective. With your outside lighting, make sure those points of entry are well lit (motion-detector lights are inexpensive and don’t use a lot of energy) and clear of thief-hiding shrubbery. When placing lights and cameras, think about how much they can see – treat them as if you’re placing sentries, because essentially that’s what you’re doing! Corners are great, especially if they can oscillate and see all around from there. You can’t sneak past a camera through a wall! Make sure the ends of the camera’s oscillation ‘touch’ the walls though, or you’ve just made them a handy little invisibility path! If you’re placing dummy cameras, make sure they’re very visible and preferably have blinking LEDs on them (an easy thing to make if yours haven’t). Something that can be seen from the road is best, and from any other likely access points. 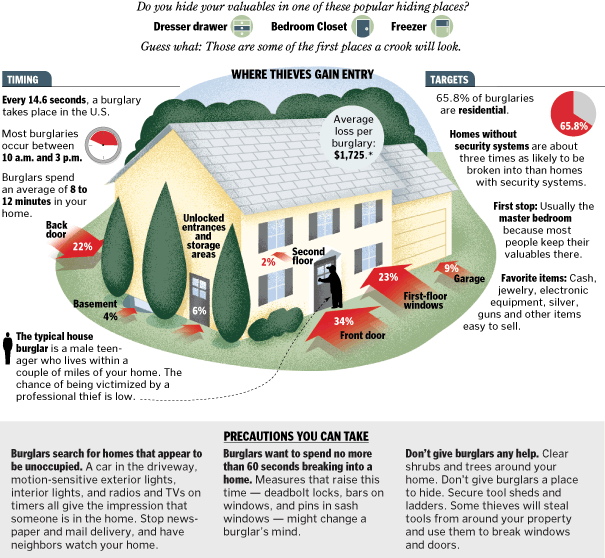 Always think about where a thief can hide around your house, and what you can do about it. Try breaking into your house yourself (simulated of course, unless you really want to test out your windows’ anti-shatter strength!) to see where your security holes are. An average of 8 to 12 minutes is all burglars spend in your home. If a thief does get into your house, you can prevent loss of your valuable objects by making them harder to find than within those 12 minutes. The dresser drawer, bedroom closet, and freezer are some of the first places thieves look, so forget about those hiding places. Instead, consider hiding things in plain sight. Perhaps set up a red herring for possible thieves: Leave out an old laptop the thief can quickly grab and go. Even better: install Prey to track the stolen laptop. Once again, I would take this information in, but I wouldn’t swear by it. The mindset of ‘He’s probably gone, it’s been 15 minutes, so we can come out from hiding now…’ isn’t what I would recommend! That’s only if you’re in though of course. Making things hard to find is a great third defence, after making the house look unappealing to burglars, then making it difficult for them to get in. The longer they’ve got to mess around, the more likely the police will arrive or they’ll give up, panic, and leave empty’-handed. The links are worth following in this quote. Prey is invaluable, and I may do an article on it myself. I have it installed on both of my computers and my phone. We’ve previously noted several ways to protect your home while traveling, including using push lights in your windows and asking your neighbors for a vacation check. Lifehacker reader fiji.siv reminded us of a small detail like not having your garbage cans put out as a sign that you’re away; make sure any help you get from friends or neighbors include the little stuff like that (putting out garbage cans, getting the mail, maybe even cutting the grass). Don’t forget the daily stuff like stopping newspaper and mail delivery, if you don’t have someone picking those up for you. And, of course, the tried-and-true method of looking like you’re home: use a random timer on your indoor lights or TV. This is all, once again, well worth paying attention to – basically just make it look like you’re in when you’re not! There are loads of ways you can do this, as the link in this quote shows you. 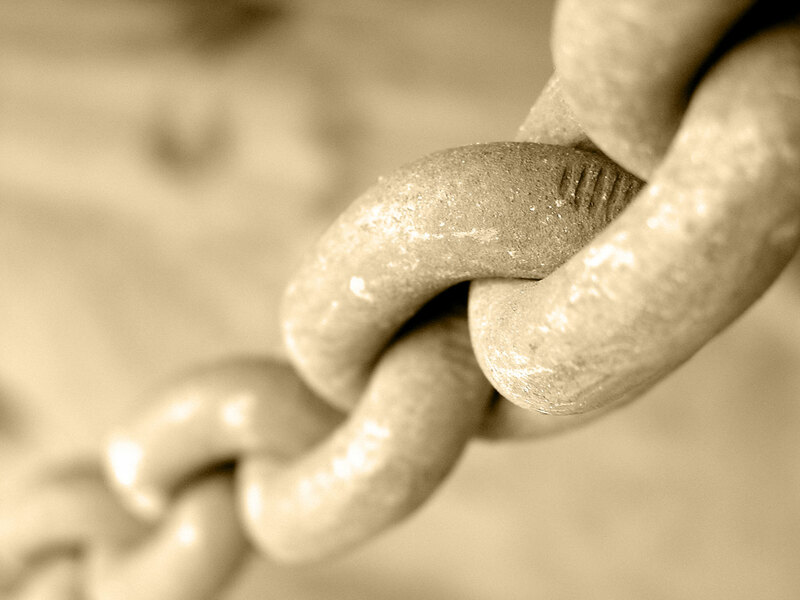 There’s a lot of other information in the comments on Lifehacker, so that’s also worth a look. What measures do you take? Feel free to share your thoughts in the comments below, or if you’re especially awesome, join the discussion on the CSPS forum.